Classic and clever, this vegan leather crossbody and wallet can travel solo or as a magnet-attached pair. Both classic and clever, this lightweight, structured crossbody has a secret: a handy, clutch-sized wallet that snaps on and off with hidden magnets. 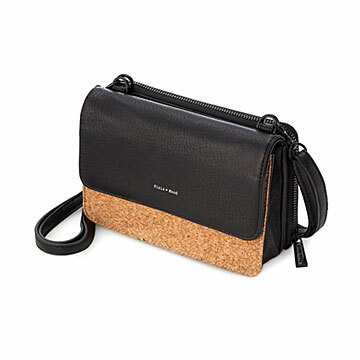 A side of cork on the bag adds textural interest while helping you tell the two apart. The wallet has dedicated slots and pockets to securely hold cards, coins, bills, and phone. The bag features an interior zip pocket and magnetic closure, and the removable long strap hooks onto handsome metal loops. Keep the wallet ready to go with your essentials and carry it with the bag or by itself. You'll never again have to worry about whether you left something crucial in another bag. Made of high quality vegan leather. Made in China. I bought this bag mainly for travel use. I got to test it out on a recent short trip and I was singing the bag's praises the whole time. It is perfect for what I have to have at my fingertips, including money, card slots, phone slot, and enough room for my other glasses while wearing sunglasses or vice versa. The bag is uniquely stylish and ai just love it. My only issue is that the strap is way too thin and could be a tad longer for my needs.